On cold days like the one today (storm “Friederike” is currently browsing through Germany), I love to eat a warm stew, soup or simply a mix of both, such as borscht. Not only does this soup stew put you in a good mood with its bright red color, but also warms you from the inside. It also happens to be super delicious and very nourishing at the same time – win-win! 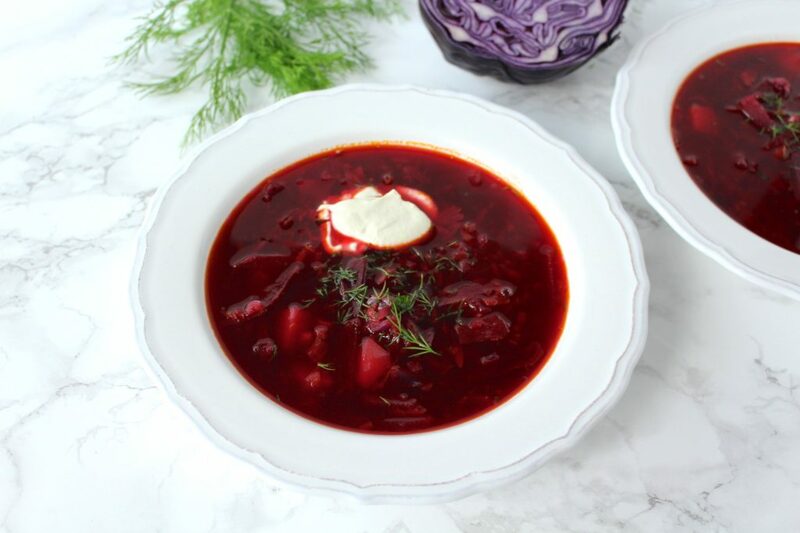 In Eastern European countries like Russia, Poland or Ukraine, borscht is served as a starter or a snack in between meals. Eating 1-2 servings of this stew – maybe even with some bread – you’ll notice how saturating it is though. This recipe does require some time; however you’ll be rewarded with super delicious & nourishing food, which may even be enough for the next few days. 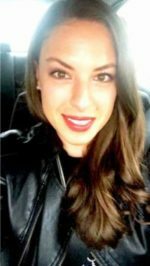 So in the long-term you’ll save time – win-win-win! But wait, it’s best eaten with a dollop of this incredibly delicious sour cream, which you should also keep in the fridge for other dishes at all times. 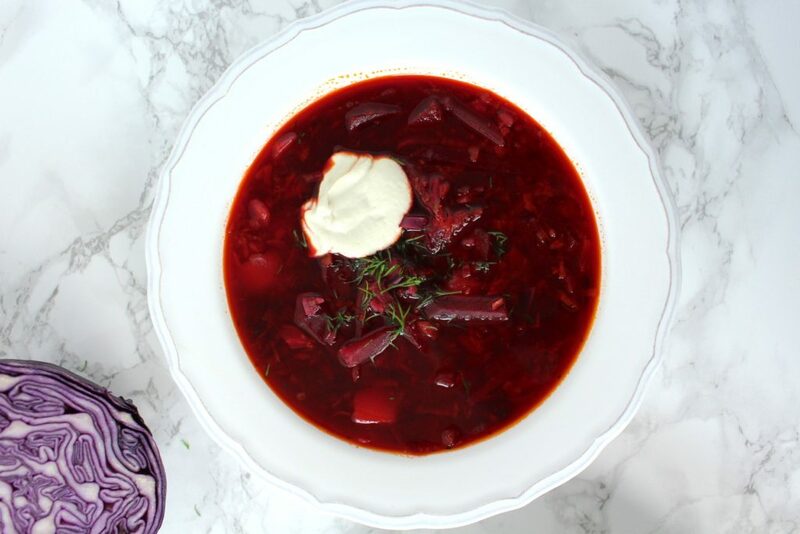 Creating this recipe, I got my inspiration from traditional Ukrainian borscht recipes. Obviously, I omitted the meat as well as the meat broth, which are normally used. Instead, beans provide a good source of healthy protein and make the stew richer. Last, but not least, I had a celery stalk and a head of red cabbage to use up. That is also why I used red instead of white cabbage. Fill a large pot with 5 cups of water. Add beets and boil covered for about 1 hour or until you can smoothly pierce the beets with a fork. Then remove beets from the water and set aside to cool. Keep the water. Add potatoes to the beet water and cook for about 15-20 minutes. Add cabbage to the pot when potatoes are half way done, that is after about 8 minutes. Add some cooking oil to a pan and cook onion until translucent. Add carrots and celery and sauté for about 5 minutes, stirring occasionally. Finally add tomato paste and cook for another minute or two. Peel and thinly slice beets (wearing gloves!) before adding them to the soup pot. Add beans, lemon juice, sugar and the bayleaf to the pot and fill it with vegetable broth. Finally add sautéed vegetables and herbs to the pot and cook another 5 minutes. Season to taste with salt and pepper. Serve hot with a dollop of sour cream or yoghurt. I hope you love this recipe – please let me know in the comment section below! If you make this dish, make sure to take a photo and share it on my Facebook page or on Instagram, using the hashtag #minamadefood. Oh and don’t forget to tag me (@thisisminamade) so that I can see your creations! Creamy Pumpkin Soup - Quick, Easy and So Delicious!